The Guide to Get Rich: Find Your Strengths, Collaborate, and Be The Best! Find Your Strengths, Collaborate, and Be The Best! 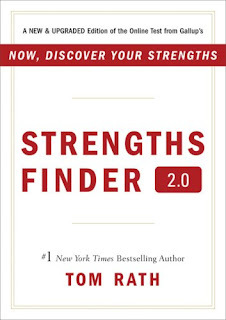 The book of the week was Strengths Finder 2.0 by Tom Rath. This book was a recommendation of Amazon and I didn't know what to expect when I bought it. However, Amazon's recommendations have led me to great books in the past and I wasn't disappointed by this one either. That being said, the book's format definitely threw me. There is only about 50 pages worth of reading because the main point of this book revolves around an online test. You read about 50 pages about the importance of your strengths and identifying them and then you log into the strengths finder website, using a one-time code in the back of the book and take your strengths finder test. The results will bring up your top 5 character themes out of 34 different types. The point of identification is to help you improve on your best traits. The book helps you do this by giving you a summary of your 5 different themes, showing quotes from people with the different themes and creating a personal action plan to get your specific themes even stronger. Like a muscle... a great personality theme only gets stronger when it is worked out. I want to stress upon you the importance of identifying your strengths. So often people focus only on their weaknesses and tirelessly try and improve on the things that they are not good at. The problem with this mindset is that you will work yourself into the ground and will most likely never be as good as the best. A physical example would be basketball, if you are 5' 2", 130lbs and practice for hours everyday to be the next Shaq, you will eventually be on the court with a person 2 feet taller and 200 lbs heavier than you and they will have the advantage.. resulting in years of time that could have been utilized more effectively. Now I am not saying that you shouldn't focus on your weaknesses... you should be aware of all your weaknesses and try to improve those skill-sets, but it should not be the most important thing you are working on. If that same, 5' 2" 130 lbs person, was naturally great at writing, and worked tirelessly on improving their writing skills. It would come naturally and expediently... and they may become the next Mark Twain. In Strengths Finder 2.0 Tom Rath tells a story famously described by Mark Twain in fact. Story goes, a man was at the Pearly Gates and asked Saint Peter a question... "Who was the greatest general of all time?" Saint Peter responded, "Oh that's simple, It's that man right over there." The Gentleman said "You must be mistaken, I knew that man and he was just a simple laborer." Saint Peter said "That's right, He WOULD have been the greatest general of all time, if he had been a general." It is very important to analyze yourself and find out what your real talents are... To put this in terms of getting rich: If you find that you are great at marketing, but don't have the ability to negotiate, hire, speak publicly, budget etc... you build yourself a team. If each person in your team is as expert in their given field as you are at marketing, you'll have a cash-cow team! Whatever product or service you decide to dive into will be a winner. Additionally, it is important to know what your natural talents are when making the transition from school to the "real world." When you find your natural talents, you can represent yourself accurately and impressively to potential employers and really land yourself a great career path. My 5 character themes after taking the Strengths Finder 2.0 was Achiever, Competition, Maximizer, Futurist, and Learner. I think it is very accurate and I will use my newly acquired action plan to strengthen my skills in those areas. I also know I need to keep a look out for the additional 29 character themes within people to make my professional network a complete powerhouse! One of the most important things I have learned is: You can't be the best at everything by yourself, so surround yourself with people that compensate for your shortcomings. I recommend this book to absolutely everyone. The book will take about 45 minutes to read and the quiz should take about 30 minutes. The results will really help you identify your talents. It is very difficult to self-identify all your strengths so use this book as a resource. If you have any questions on the book don't hesitate to ask. I would be more than happy to help anyone that wants it. this was a required book for a class i took...i agree, a quick and beneficial read. thanks for your "reviewing approach" to life, man! hope all is well! Who is the Average Millionaire?